11/11/2015. Our station Mersey (ON1183 12-24) Lil Cunningham returned to station after her refit at Poole HQ. The relief Mersey (ON1178 12-21) Margaret Jean was taken to Conwy to swap over there, and the lifeboat was taken back into the relief fleet. 3/11/2015. 1300 Rhyl AWB crew were paged to come to immediate readiness as the Douglas platform gas and oil rig, 12 miles out, had declared a full alarm and muster. The crew kitted up and stood by until they were informed by Holyhead Coastguard that the alert was over, and the crew could stand down. This was at 1320. Classed as a standby. 7/10/2015. 1752 A 7m yacht with 2 persons on board, was on passage from Bangor to Rhyl, but had arrived too early to be able to safely enter Rhyl harbour with sufficient depth of water. On getting to the perch marking the outer entrance to the harbour, the engine on the yacht failed, and with onshore winds and heavy surf, they could not sail the yacht, so called for assistance. The AWB crew were paged immediately by Holyhead coastguard, and the lifeboat was launched into heavy surf about 12 minutes later. 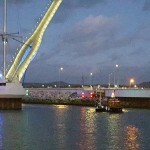 The yacht was anchored in less than 2m of water, being pounded by the surf, and the crew on board had become fatigued. The AWB could not come alongside immediately as the motion of the yacht at anchor, broadside on to the surf, was causing it to sway and move erratically. A tow line was successfully thrown to the yacht, but the crew were seen to be very weary and unable to either pull the tow line in to secure it; or to raise their anchor. There was less than 1m under the AWB in the swell, so the coxswain decided to tell the crew on the yacht to cast off the tow line. This was done and the tow line was retrieved safely back to the lifeboat. 2 passes were tried to then get a lifeboat crew member on to the yacht, but due to the rolling of the boats, it was found difficult to get close enough. one of the crew then volunteered to swim to the yacht. This was completed successfully, and now the anchor was released, it’s position noted by the lifeboat navigator, and the AWB then successfully got clearance on the seaward side of the yacht to get the towline aboard and secured. Once the tow was started, passage was made steadily out of the surf, which was over 2m high and with breaking waves, until calmer water was encountered to lengthen the tow line so the yacht could be taken comfortably in to Rhyl harbour. 19/9/2015.2145 Both boats were requested by Holyhead coastguard to launch to search for a person threatening self-harm, thought to be on the beach at Prestatyn. The ILB launched first and got to the search area just as the Coastguard reported that the Police had now had further information that the person was actually off Pensarn, on the beach. The boats and the local coastguard teams were diverted to this new area to search. after a long search between Rhyl and Pensarn , nothing was found on the beach, so all marine Search and rescue units were recalled, the boats returning to station at 0120 the next morning. 8/9/2015. 1112. The mechanic and other crew were on station for their six-monthly inspection prior to exercising in the evening, when Holyhead Coastguard informed them of a sports fishing boat, which had engine failure 6.5 miles North-west of the station. The LOM was informed, and the pagers set off . The Divisional Operations and Technical managers also took the opportunity to go afloat on the boat, to see how the crew worked in a real-life rescue. 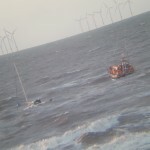 The two persons on the boat were in the Rhyl Flats windfarm, and were being monitored by a local windfarm support vessel. The boat had total engine failure, but the two people were well prepared for their fishing trip, having lifejackets and a radio to hand. 30/8/2015. 0746. The crew were awoken from their slumbers at 7.46am on Sunday, to come to immediate readiness for assistance to the gas rig at the Douglas Complex, 11 miles out. As the crew were assembling, the rig reported a false alarm and the crew were stood down at 0755, classing this service as a standby. The crew had just started allowing the public to board the lifeboat at the station at 1230, when Rhyl harbour master reported a small leisure fishing boat with four people on board, out of Rhyl, had developed engine trouble. 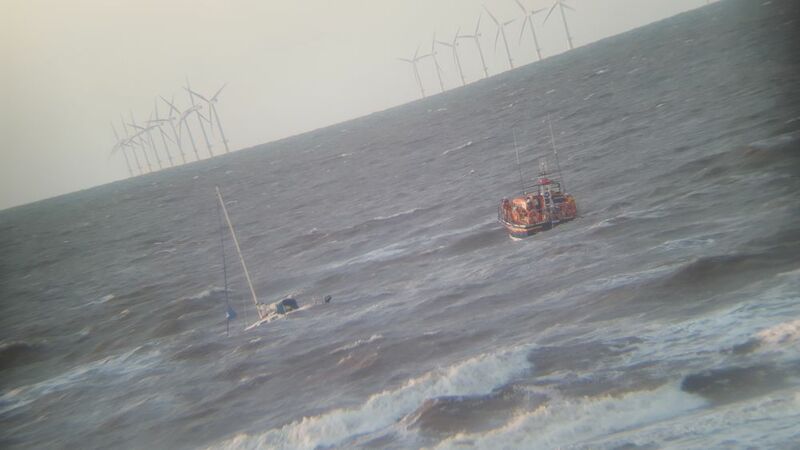 The All-weather lifeboat launched within five minutes, and found the boat with three adults, one child and one dog, about three miles North-West of Rhyl, around the Rhyl Flats wind farm. A tow was undertaken to Rhyl harbour, after taking two adults and the child off the boat for safety reasons due. At Rhyl harbour entrance, the tow was transferred to the inshore lifeboat to take the boat under Rhyl pedestrian/cycle bridge, so it did not need to be raised because of the impending start of the air show. The casualty was returned to it’s launching slipway at 1350. Because the Air Show was starting at 1400, the lifeboats were unable to recover, as they would be encroaching into the restricted zone around the display area. They therefore held off some distance out , and enjoyed some of the displays there. At 1456, a call came through from the beach lifeguards at Prestatyn, that a lady had dislocated her knee on the beach at Ffrith in Prestatyn. The lifeguards reported access for emergency services was limited, and so the lifeboats made their way to just offshore the casualty. 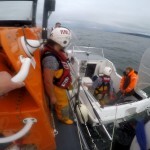 Two of the crew waded from the lifeboat to shore with first aid and pain relief, and this was followed up by the inshore lifeboat crew and a basket stretcher for the casualty. 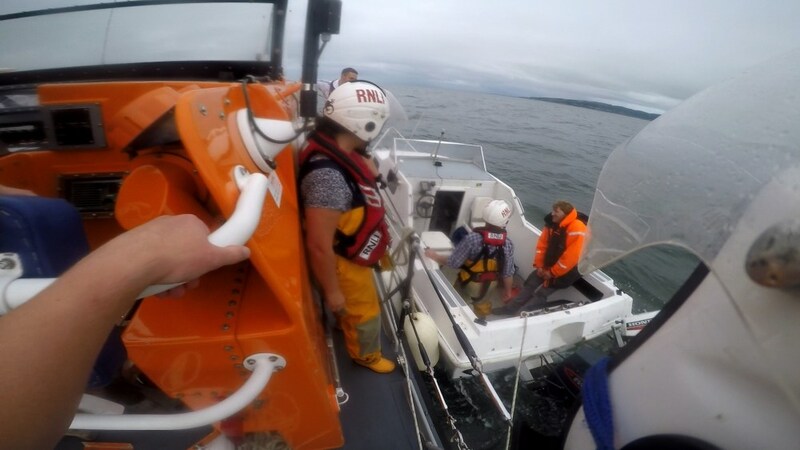 Treatment was carried out with the assistance of local coastguards and the lifeguards, and the lady was made comfortable until an ambulance neared the site. The lady was taken in the stretcher to the ambulance, handed over to the ambulance personnel, and then the lifeboat crews returned to their boats at 1549. 23/8/2015. 0936 Rhyl and Hoylake boats were put at immediate readiness to attend a full muster on the offshore gas rig at the Douglas Complex, 11 miles out. Two support vessels were already in attendance. As Rhyl lifeboat got to the water’s edge, Holyhead Coastguard reported the alarm was a false alarm and the lifeboats were stood down. Classed as a standby. 17/8/2015. Our station Mersey 12-24 “Lil Cunningham” has been replaced by 12-21 “Margaret Jean” whilst our boat goes to Poole for it’s 5-yearly refit. 16/8/2015. 1024 As the crew were preparing for the station’s Open day, Holyhead Coastguard set off the pagers for the AWB to launch to a large leisure fishing boat with mechanical problems off Colwyn Bay, as the skipper wanted to get to Rhyl harbour. As the lifeboat drew near, the skipper managed to re-start his engine, and so the lifeboat escorted the casualty back to Rhyl harbour, then returned to station at 1200. 14/8/2015. 0517 The AWB crew were paged to stand-by as the Douglas Gas Complex, 12 miles out, had signalled a full evacuation muster. As the crew were arriving and getting ready, the coxswain contacted Holyhead Coastguard. After a couple of minutes the coastguard said the muster was cancelled and the crew could stand down at 0522. Classed as standby. 26/7/2015.1427 Both boats paged to assist Llandudno lifeboat search for an overdue kayak around the Old Colwyn area. as the crew were assembling, Llandudno ILB reported they had found the man and his kayak, safe and well and fishing. Rhyl lifeboats were stood down, classing as standby. 22/7/2015. 1452 Both boats were requested to launch to assist paramedics and local coastguard teams at Talacre, after a rider was thrown from a horse near to the water’s edge, with an incoming tide, causing evacuation by land difficult. The ILB arrived on scene first, and the crew stood by as the person was assessed by paramedics. They decided the casualty was capable of being evacuated by land and so the lifeboats were stood down. The AWB was off Prestatyn at the time and the ILB was on scene at Talacre. Both boats returned to station by 1559. 15/7/15. 0928 Both the ILB and AWB were called out after a life raft was reported to the east of Raynes quarry at Llandulas. The AWB launched first and picked up the life raft. The coastguard confirmed that this was off a missing fishing vessel, and so the search was widened to encompass an area where the vessel might be. Rhyl ILB,Llandudno ILB and AWB were also tasked to search, together with Rescue 936 helicopter and coastguard shore teams. Over the course of the day, the lifeboats and helicopter searched a massive area, each lifeboat covering over 110 nautical miles in the search. Rhyl lifeboat was launched 3 times during the search, after recovering to deliver the life raft to coastguard; and to refuel. The inshore lifeboats also had to refuel 3 times. The search was called off at 2200, with lifeboats being at sea for over 13 hours. 11/7/2015. 1405 The AWB was called out after a dive boat about 11 miles off Rhyl called a “Mayday” as they had engine trouble, and had become parted from the divers on the surface. 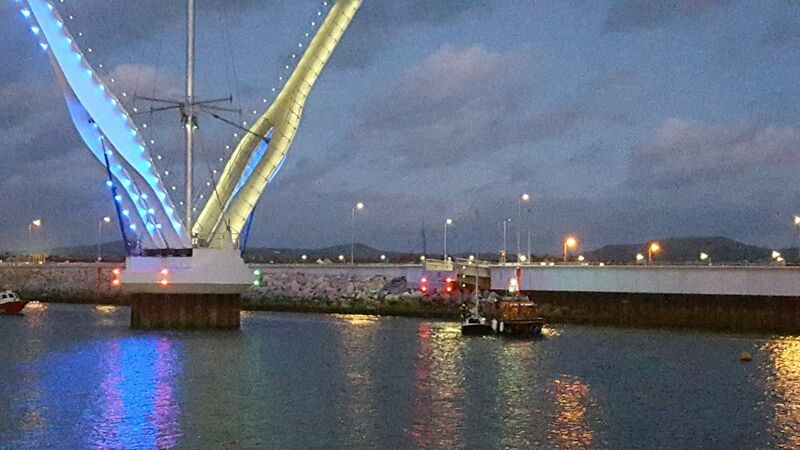 other vessels in the area came to their aid and recovered the divers back to the dive boat. The lifeboat approached just as the divers regained control of their engine, and started off for their start point at Conwy. The lifeboat escorted the dive boat until they were off Llandulas, then returned to station as all was safe and well. The lifeboat returned to station at 1600. 16/6/2015. 0221 Both boats were called out after Holyhead Coastguard were contacted by North Wales Police to assist in locating a despondent male, in the sea off central Rhyl, not far from the boathouse. Police officers were already searching the promenade, and local coastguard volunteers were also paged to search, together with the Police Helicopter from Rhuddlan. The search was centred around the shoreline off the Sky Tower. The ILB launched first, followed soon after by the AWB, to help illuminate the area. The Police helicopter located the man after about 15 minutes, lying face down on an offshore sandbank, so they directed the crew to the location. As the tide was going out, coastguard officers were also able to attend the scene, and together with the ILB crew, reached the man, and put him in a stretcher to get him back to shore. The man was conscious but appeared to be getting hypothermic, and so an ambulance was called and directed to the area behind the sky tower. The man was handed over to the ambulance crew and police, and both boats returned to station by 4am. 29/5/2015. 1412 Holyhead Coastguard requested the ILB to assist coastguards and police search for a vulnerable male who was on Talacre beach, heading for the sea. Flint and Rhyl coastguards were on scene. Because the wind was over force 6 from the North-west with a rough sea, the coxswain decided this would be a difficult transition for the ILB and so the AWB pagers were set off . The crew were assembling when Holyhead coastguard reported the male was safely ashore and now in no danger, so the AWB was stood down at 1430. Classed as a standby. Both boats were launched, and Rhyl coastguard team mustered, after a crew member noticed a small 14-feet day boat apparently having engine trouble, about 1.5 miles north of Llandulas beach. Holyhead coastguard were contacted and agreed to the boats launching. The ILB was first in the area, closely followed by the all-weather boat. The area was searched up to 2 miles out, but the only vessel in the area was anchored off Rhos-on-Sea. The coastguard told the lifeboats to return to station, but then held the lifeboat back after they took a 999 call from the boat off Rhos-on-sea. The coastguard then said they were launching Llandudno inshore lifeboat, and stood down the Rhyl lifeboats. Both boats returned to station by 1355. It transpired that the boat that Llandudno ILB towed in, was the same boat that the Rhyl lifeboats were looking for.